Located at the sports park surrounding the historic Los Angeles Memorial Colosseum, FYF is the baby brother of the Coachella Valley Music and Arts Festival. FYF may not have the expansive lineup or the sacred desert pilgrimage feel of Coachella, but it’s a decent music festival regardless. This year’s lineup contains a few artists that are unlikely to come to my home town of Phoenix, Arizona, as well as a few bucket list bands that I’ve been itching to cross off my list. I attended FYF in 2012 and when the 2015 lineup was announced, I decided it was time to return to LaLa Land. After a very long Saturday of festivaling at FYF, my crew got a bit of a late start on our Sunday. We had a good plan, we just didn’t stick to it. Our tentative agenda was to get up, grab some lunch and beer at Blue Palms Brewhouse in Hollywood, make a pilgrimage to Amoeba Music and then get to the festival grounds by 4:45 to see Neon Indian. The beers were cold, the burgers were big and there is no such thing as a quick trip to Amoeba so we ended up arriving at the venue at about 6:30, just in time to see Battles start their set. Oops. Battles come to us from another universe. Their 2007 debut album Mirrored is a wildly imaginative monument to experimental math rock weirdness and it spawned one of the decade’s finest songs in “Atlas”. After their lead singer Tyondai Braxton left the band, Battles released the equally strange but admittedly less impressive Gloss Drop in 2011. With their new album La Di Da Di just weeks away from release, I was excited hear what these avant-garde rockers had cooked up in the four years since Gloss Drop. Unfortunately, Battles seemed a bit rusty. A few of their sample loops missed their cues and despite promising to play it, Battles ran out of time before being able to play their new single “The Yabba”. Battles’ sound is incredibly complex and I get that recreating their studio sound live (especially with only three members on stage) must be extraordinarily difficult but I’ve seen them perform live with razor sharp accuracy before. This time around, things just seemed a bit off but I still believe in Battles and I can’t wait to hear La Di Da Di. From the Trees Stage, we booked it to the Main Stage beer garden to hear Flume. The Australian producer started as the sun dipped below the horizon and our FYF party instantly hit a new level. He brought out several guests during the set including Miike Snow’s Andrew Wyatt, some dude named Marcus(? ), and Lorde…kind of. In the middle of Flume’s absolutely bangin’ remix of Lorde’s “Tennis Court”, she runs out on stage and starts dancing next to Flume. Apparently he had no idea she was there so it surprised us all to see her on stage and even though she didn’t sing her own song, it was a cool moment regardless. Some dude on the roof of the apartment building across the street started dancing like a maniac as soon as the set started and by the time Flume finished, a whole crowd of glow stick wielding dance machines had joined him at the impromptu roof party. The set finished with my two favorite Flume songs – “Insane” and his dazzling remix of Disclosure’s “You and Me”. Kanye West won the weekend but Flume’s electrifying set was a close second place. Following Flume at the Main Stage was Scotland’s own Belle & Sebastian. Despite being on my bucket list for many years, I picked Run the Jewels over Belle & Sebastian at Coachella so I was determined not to miss them a second time in the same year. The legendary indie rockers were absolutely delightful. On either side of the stage there were small clusters of giddy fans who were led in a spontaneous synchronized(ish) dance routine by a mysterious dance commander/choreographer positioned at the center of the stage behind the band. It was a little detail that made for a sloppy but consistently cute stage gag. 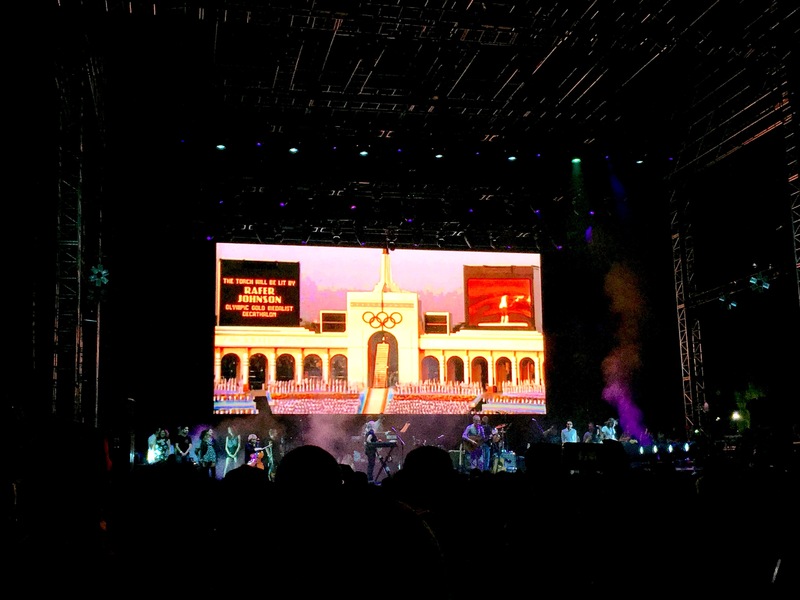 While playing their classic hit “Stars of Track and Field”, the screen behind the band showed footage from the 1984 Olympics which were hosted just a few hundred feet from the stage. As I looked around the largely bearded and bespectacled crowd, everyone seemed to have the same nostalgic little grin. Belle & Sebastian live are exactly what I expected: familiar, charming and absolutely delightful. We made it back to the Lawn Stage just in time to see D’Angelo and The Vanguard start. Until he released Black Messiah late last year, I was entirely unaware of D’Angelo. The last time he released an album (Brown Sugar, 2000), I was just starting to discover music outside my parent’s limited CD collection. Black Messiah is a powerful introduction to a once wildly popular artist and his live show is a soaring celebration of R&B. Along with his massive new band The Vanguard, D’Angelo wasted no time seducing the crowd. With a rather Prince-esque outfit and bedazzled guitar, D’Angelo opened the set with “Ain’t That Easy” and spent the following 75 minutes showing off his skill as an elite R&B craftsmen and a supremely gifted live performer. The Vanguard’s adept musicianship was on full display as they bounded through extended versions of Black Messiah tracks culminating in “Brown Sugar” and a 10 minute version of “Sugah Daddy” filled with several false endings and perfectly executed restarts. They’ve got everything necessary to become festival favorites for years to come; let’s just hope D’Angelo doesn’t disappear for another 15 years. Like Belle and Sebastian, Morrissey has been lingering on my bucket list for years. I am part of this very weird minority of people who prefer Morrissey’s solo catalogue to anything The Smiths ever released. I know this is an unpopular opinion but I’m sorry I’m not sorry because Bona Drag and You Are The Quarry are dope records. He put on a serviceable live show that did a fine job of showing off both his incredible vocal talent and his immeasurable angst. He antagonized security, demanding that most of them leave and moments later a fan rushed the stage and gave the Moz a big ol’ hug. I was hoping to hear “How Soon Is Now” but I was content to hear “Everyday Is Like Sunday”. While playing The Smiths’ “Meat Is Murder”, the massive screen behind the stage showed a barrage of ultra-graphic footage of animals being slaughtered. Some dude in front of us couldn’t handle it and bailed about 30 seconds into the track. It was simultaneously the most zealous display of vegetarianism and the most disturbing thing I’ve ever seen at a concert. All part of the Morrissey experience I suppose. FYF 2015 ended with FKA Twigs at the Trees Stage. It was an ornately choreographed performance filled with deep bassy synths, backup dancers and a whole lot of sexually charged future R&B. Maybe it was our distance from the stage, maybe I was just exhausted, maybe it was because my back was starting to ache but to no fault of her own, FKA Twigs failed to capture my attention. Her set ended at 12:30 and we made our way to the exit. Uber back to our Air B&B. Night cap. Sleep. Fin.